Nature has always been a big passion and the relation of nature and man-made environments is something I often try to confront in my work. The Sky in a Room was first inspired by the forests’ fires that in 2007 destroyed a big part of the south of Europe. They were largely man-made fires, intending to generate new land available for building speculation. 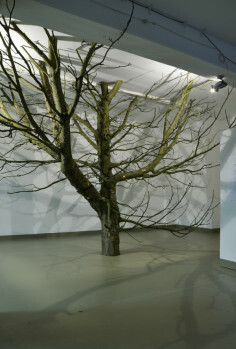 A sick tree was cut down by the municipality of Rotterdam, cut in smaller pieces, archived and re-built inside the exhibition space, against the architectural surfaces of the gallery. The trunk of the tree was removed in order to give the public a different physical relation to the tree itself and to the white sterilized space of the gallery. The dead tree presents its branches covered with a layer of moss and molds creating a suspended landscape. All images are copyright of the artist. the aura is when the art ‘is’, and the art exists only at the time when the aura is simultaneously present. My work explores the socio-economical, cultural and political practices that intervene on, and alter the form of contemporary natural landscapes around us. Subject both of science and art, the landscape functions both as a mirror and as a lens: in it we see the space we occupy and ourselves as we occupy it. With my work I abstract and re-interpret landscapes engaging in an open-ended investigation of transferring the physical experience of a territory away from the locus of its original existence. My aim is to confront the public with nature’s omnipresence, creating new spaces of sensorial and social experiences. Intending to provide the audience with an active role in my work I use a variety of techniques and media, such as installations, performances, workshops and public art, to better address the needs of each idea. The heterotopic landscapes I create constitute places of memories in which the emotions of single individuals become inevitably part of a collective experience. With my work I want to preserve the aura; the aura of the original work of art, as Walter Benjamin describes, and the aura of the landscape it refers to. This altered relationship between the public and the instance of art has influenced my turn towards site-specific, experience oriented and sensorial art works. In this practice of art it is still possible to ‘safeguard’ the aura because reproduction is virtually impossible. The only way to experience the artwork, is to experience, so to speak, the ‘original’. Bourriaud claims that “the role of artworks is no longer to form imaginary and utopian realities, but to actually be ways of living and models of action within the existing real”. The artwork rather than being an encounter between a viewer and an object, produces intersubjective encounters. Through these encounters, meaning is elaborated collectively, rather than in the space of individual consumption. Giuseppe Licari was born in Sicily and is currently based in Rotterdam. He studied Painting at the Academy of fine Arts in Bologna and Monumental Art at AKI Enschede, in the Netherlands. His work focuses on the cross-border of the natural world and the built environment, exploring the territories emerging from their encounters. His heterotopic landscapes constitute places of memories, in which the emotions of single individuals become inevitably part of a collective experience. Licari has been the recipient of significant grants including: the Starter Stipendium and the Work Budget by Mondriaan Fonds, Amsterdam, the O&O fellowship by CBK Rotterdam and residency grants at Iaspis Stockholm and at Badgast Den Haag. He has been a collaborator in several on site research projects with the Historisch Museum Rotterdam, the TU Delft and the Politecnico of Milan. His works have been exhibited internationally, including New Holland St. Petersburg, UAB Visual Arts Gallery at Birmingham USA, Tent Rotterdam and Action Field Kodra Thessaloniki.